I am eager to tell you about a new initiative, “Faces of EE,” that highlights energy efficiency professionals. Join us to help reveal the unsung heroes of a largely invisible workforce. Our aim is to bring a well-documented message to policymakers and the public: Strong, non-partisan energy efficiency policies can expand a vital workforce in every community nationwide. Together we can keep building positive momentum for jobs that capture superb ROI. One of the 250 testimonial statements my team created into memes so far. 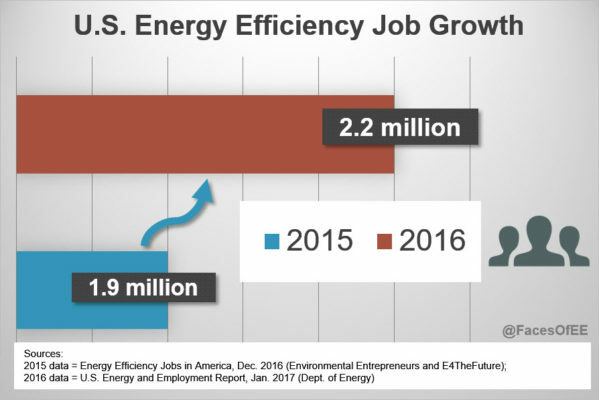 This education initiative builds upon the report Energy Efficiency Jobs in America, a collaboration by E2 and E4TheFuture released in December 2016. By providing a detailed breakdown of data from the National Bureau of Labor Statistics the report shows policymakers energy efficiency jobs in each state and metropolitan area, and by congressional district. The U.S. Department of Energy issued its National Energy Employment Analysis a few weeks later. In this document which encompassed all energy sectors, the Department of Energy verified the year-over-year growth in EE jobs that had been predicted in our report. General comparison of efficiency jobs in 2015 and 2016. 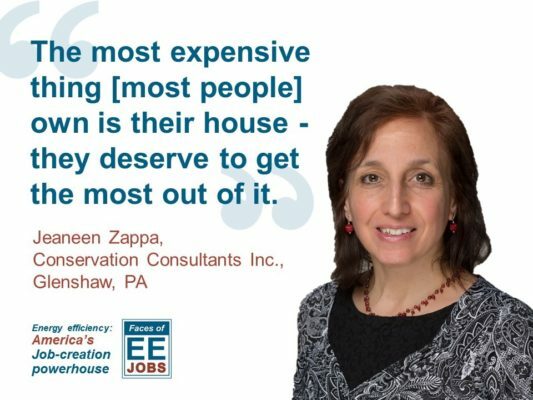 Excerpted from the Energy Efficiency Jobs in America report. Why Focus on Faces of EE? 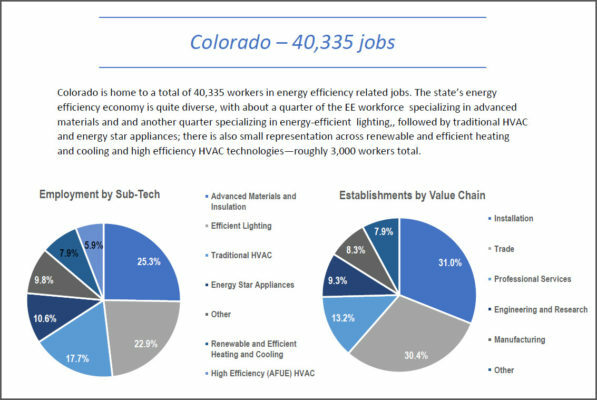 Following the release of the two reports, our team visited more than 60 congressional offices to share summaries detailing the energy efficiency jobs in their state and congressional district (pictured: an excerpt from the Colorado summary). Every visit was marked by surprise. Policymakers did not realize the size and scale of the EE industry among their constituency. Our conversations revealed that people can easily visualize solar and wind industry jobs. But EE jobs? Not so much. • What is an EE job? • Who does an EE job? • Where do people with EE jobs work? We quickly realized the need for, and value that would arise from, highlighting the range of individuals who work in EE jobs. To accomplish this, our team began by hosting a “Faces of EE” photo booth at the Home Performance Coalition (HPC) national conference. We gathered pictures, job descriptions and testimonials. My team and I collected data representing 300+ professionals from 45 states. From business owners to “boots on the ground,” from Alaska to Mississippi, we met people who are passionate about their work in all aspects of the EE industry. 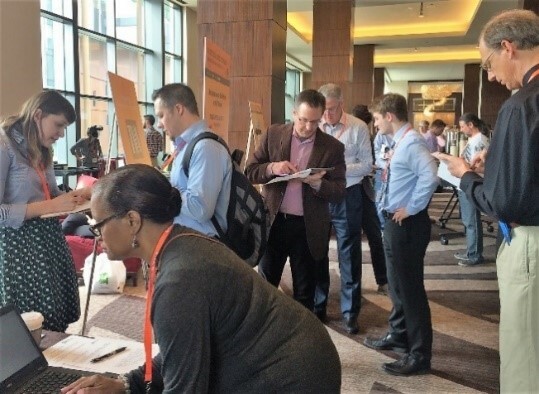 Attendees at HPC’s Nashville event spanned sectors and skill sets including construction, manufacturing, software, finance, management, energy auditors and marketing professionals, to name just a few. Since April, my team has been converting data into memes portraying real people, with real EE jobs. We are just getting started. Visit Twitter (@FacesOfEE) to see campaigns focused on Maryland and Pennsylvania, plus key shareable content. Please follow us and share, to inform and illuminate your own connections. Be on the lookout, as we will host more photo shoots to help unveil the magnitude of one of the nation’s biggest job sectors. We hope you will also consider participating in additional advocacy efforts to support the EE industry. You can sign up using this convenient Google form to indicate your interest. Follow @FacesOfEE to meet some of the 2.2+ million Americans working in the EE industry, and tell your friends!